Does triple damage on a critical hit and a +1 dodge bonus to your Defense not quite match your vision of the martial arts expertise of Bruce Lee, Jackie Chan, Jet Li, and Gordon Liu? Then Martial Arts Mayhem is for you! Written by d20 Modern Roleplaying Game designer Rich Redman, this book includes enough new feats, techniques, schools, and weapons to transform the Brawl, Combat Martial Arts, and Defensive Martial Arts feats into a dizzying array of combat options! Your heroes can become brutal masters of the Bare-Knuckle Brawling school, master martial arts weaponry as students of Kobujutsu, or confuse and bewilder opponents as masters of Drunken Fighting. * And the best part: zero prestige classes! With the schools, feats, and techniques in this book, any character can be a devastating martial artist - not just those characters who took levels in Martial Artist! 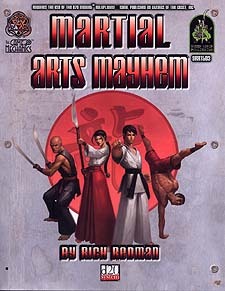 Martial Arts Mayhem is a printed compilaton of the Martial Arts Mayhem sourcebooks from The Game Mechanics. Originally released in PDF-format, the material in this book is designed to maintain the balance between firearms and martial arts found in the d20 Modern Roleplaying Game. This product requires the use of the d20 Modern Roleplaying Game core rulebook. For players and Gamemasters, this product is compaitble with d20 System roleplaying games.